What should be a season of rejoicing over Duke Vahn’s newly-recovered son is overshadowed by fear of an uncertain future. Vahn’s brother, King Arx, expands the war with neighboring Ganluc, while enemies at home seek to shatter the Rebono dynasty forever. Strained relations between royal twins harden into cold suspicion and treasonous accusations while a deadly plague sweeps across the land. As the royal bloodline is torn asunder, two races, the Elva and Itzi, discover that only together can they stop the plague and restore their unraveling kingdom. Book 3 of the Ascendancy Trilogy series. 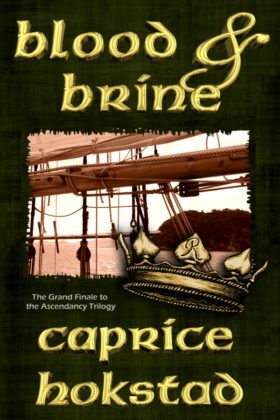 Caprice Hokstad wraps up her Ascendancy Trilogy masterfully. There’s war, plague, creative military tactics, Joseph-style economics, a mass murder mystery, assassins, betrayal, and the divinely-inspired birth of modern medicine, all of which will keep on the edge of your seat and wanting more.